With the creation of the Lufthansa Innovation Hub, the German airline signaled to the World that it is serious (after all,. Germans are supposed to be serious people, isn't it?) about its commitment to technology and innovation. Lufthansa Innovation Hub is aptly located in more "hip" Berlin, Germany's startup capital, rather than in Frankfurt or Munich where Lufthansa has its hubs. It provides a vehicle for cooperation between the 65-year-old German flag carrier, startups and entrepreneurs in the field of travel technology. It also boasts quite an impressive A-Team of experts from the European technology scene. 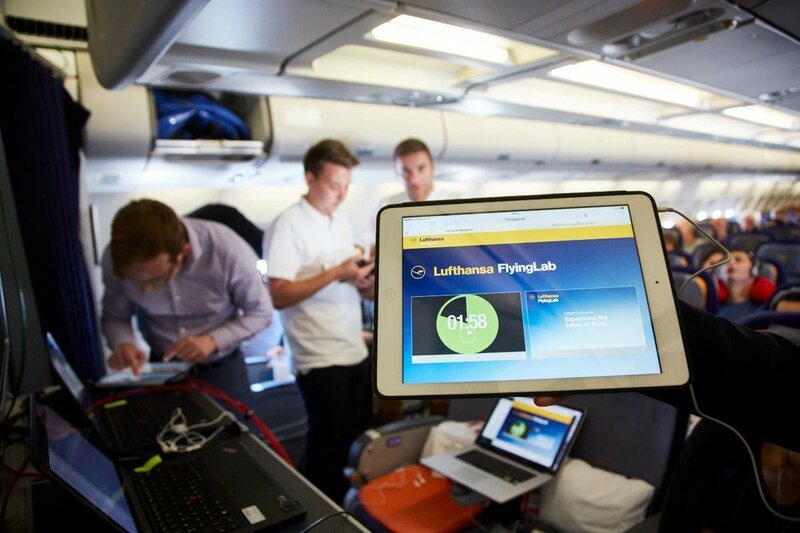 It is in this context that Lufthansa has come up with a rather interesting initiative, Lufthansa Flying Lab. The "labs" are none other than the airlines' own aircraft. What other place would be better to prove the latest Lufthansa technology? Some specific flights are designated as the venue to test some ideas aiming to improve and modernize the Lufthansa experience. This way the airline can test in real conditions the roll out of some specific system or concept, while for Lufthansa's would be suppliers it is also a great way to establish their credentials with a major industry player. For New York Fashion Week, Lufthansa created a special experience for passengers on Flight 400. A Boeing 747-800 on the Frankfurt to New York JFK route was designated as Lufthansa's Fashion Flight and became an impromptu fashion runway, with a retro-fashion show of sorts. Several models dressed in vintage Lufthansa cabin crew uniforms representative of Lufthansa's six decades of existence (to be fair, not the fist ones to have a flying fashion runway!). Several fashion experts were also invited by Lufthansa to provide their very own insights on the topic of style. These happenings are also a venue for brands to get public exposure, for example Lufthansa's Fashion Flight had the cooperation of several fashion and jewellery brands, such as Breitling, L'Oreal, Bellabeat, Gemio, Rubin Singer and Ashley Chloe. The focus was on stylish wearables, such as bracelets and wrist cuffs, with embedded technology and connectivity. Prior to that, in July 2016, Lufthansa had its first Flying Lab flight, from Frankfurt to San Jose, right next to Silicon Valley. The highlight of that flight was Samsung's Virtual Reality set, a technology that some airlines, like Air France/KLM subsidiary Transavia, are starting to test as a new channel for in-flight entertainment.